With summer officially over we have to start gearing up for this winter season and that doesn’t mean just a change to our wardrobe. Houses can get awfully cool during winter and no matter how many blankets and throws you buy you will still be left craving some heat. It’s good to think about the right home appliances to keep you warm this winter and fireplaces are still one of the most popular options. 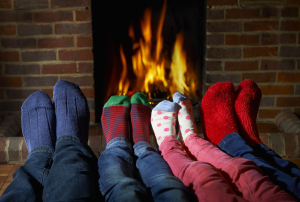 There’s nothing like gathering around the fireplace with friends and family on a cold winters night. The glow of the burning fire and scent of wood adds a cozy ambiance to any size room. You’ll find most new houses have fireplaces built-in, and not just in the living room. They’re incorporated into other rooms such a kitchens, outdoor living spaces, and dining rooms. A fireplace is a beautiful feature in any room and also very practical providing heat and creating a great focal point for friends and family to gather around. That is why it is important to have the right fireplace in your home. What is the right fireplace for you? With so many options available it’s important to know what option is the right choice for you. Aesthetics and functionality are a big factor to ensuring your fireplace is a positive element in your room. 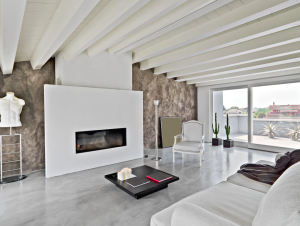 The first ideas to consider is will your fireplace be for mainly decorative or heat purposes? And would you prefer electric, gas or wood. These answers will help determine the style of the fireplace. With fuel you need to consider the cost and availability of the fuels in your area. In recent years gas has been the most popular way to fuel a fireplace, as it’s the most affordable. Wood-burning is expensive as it requires a chimney to be built-in. It can also provide great heat without needing any wood. With heating Requirements – As all wood and gas heaters have a wide range of heating capacities I recommend contacting your local dealer to help determine the square metreage of the area you need to heat. With Gas heaters pre-fabricated metal units have taken over the marketplace for cost alone. Some leading pre-fabricated fireplace manufacturers are Heatilator, Heat & Glo, Lennox Hearth Products and Quadra-Fire. You don’t need to choose a material for electric fireplaces as they come already constructed in the box. As they’re mostly smaller in size they’re deal for apartments or small rooms. With wood-burning fireplace the most common choice is brick and stone as they don’t show smoke stains. Stone is a popular material as it comes in a range of varieties such as limestone, marble, slate or ceramic tile. 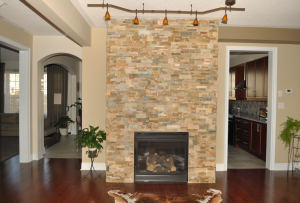 To save on cost you have the option of choosing a stone veneer. Companies which have this on the marker are Eldorado Stone and Cultured Stone. I suggest choosing darker colours if you plan on using your fireplace often. You have to decide whether you want a freestanding or inbuilt heater. The inbuilt heaters are designed to be installed into an existing masonry fireplace or into a stud frame chimneybreast using a tested and approved zero-clearance box. If you have a major theme in your room, look for a fireplace with accents that will compliment the style such as tile, brick, stone or wood. If you choose a mantle it’s a great piece to add in an accent a material. If you have a more traditional home oppose to modern maybe brick is a material that should be incorporated. You can also add decorative touches like mirrors, statues, flowers or artwork to complement your theme.